Families look forward to the Thanksgiving Day Parade all year long! 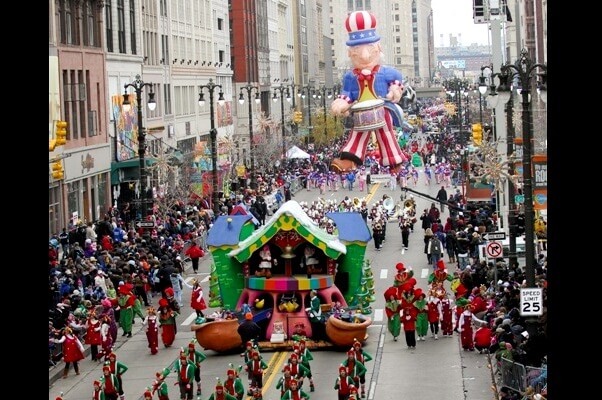 Formally known as America's Thanksgiving Parade, it follows a route down Woodward Avenue past hundreds of thousands of cheering parade-goers. You will love watching the marching bands, floats, gigantic balloons, and unique acts as they pass by. If you arrive early enough, cheer on the thousands of runners that take part in the annual Turkey Trot. They will appreciate the support! The Thanksgiving Day Parade is a great way to kick off the holiday with your family. After all, this Thanksgiving Parade isn't nationally known for nothing! It's one of the best parades that happen in the country throughout the year. Friends and family gather to share what they're thankful for, and there's nothing better for hometown pride than visiting the parade yourself! One way to make it as painless as possible is to rent a limousine or party bus for your adventure. You will be warm and comfortable the entire way through! Be sure to consider renting a limousine or party bus. After all, the traffic in the downtown area during this time is horrifying, and it's something you certainly won't want to deal with. You can enjoy bars with coolers, newly installed television screens with DVD inputs, neon lighting, premium interior design, tinted windows, and much more. Your Thanksgiving Day Parade will be much easier to deal with when you have a limousine or party bus!